MTN NG makes their 4G LTE service available for all states in Nigeria. Following the acquisition of http://ghchjgv.blogspot.com /2016/04/how-to-migrate-your-visafone-line-to-mtn.html">Visafone by MTN earlier in 2016, they have launched their 4G network and makes 4G data plans available for Nigerians while some of the users are already enjoying it. MTN 4G LTE only available in selected states before, it is now available in all states. To use MTN 4G data plan, you must be using a compatible phone and must have swapped your sim for MTN 4G sim card from any MTN office nearest to you before you can be part of MTN 4G evolution. To make things simple, MTN Nigeria makes available a short message code that can be easily used to confirm if your smartphone is compatible. If compatible, you can then go to a nearest MTN office and swapped your sim for MTN 4G sim card. Your phone must be 4G enabled. If not, don’t bother. Simply text 4G to 131. If your smartphone is compatible, you will receive a message that; Yello! Your device is 4G ready but you need to upgrade your SIM to enjoy MTN 4G LTE. Please visit the nearest MTN store or partner retailer for a sim swap now. If your phone is not compatible, you will receive a message that; Yello! You need to upgrade your SIM card and device to enjoy MTN 4G LTE. Please visit the nearest MTN store or partner retailer to upgrade now. If your Smartphone is compatible, visit the nearest MTN office and swapped your sim for MTN 4G sim card. If you have confirmed your smartphone that it's compatible with MTN 4G network and you have swapped to MTN 4G compatible sim. Dial *444# to check and choose MTN 4G data plan suitable for you. Below are some of their available data plans. 100MB for N500 (Valid for 7 days). 150MB for N499 (Valid for 24 hours). 200MB for N1000 (Valid for 30 days). Unlimited data for N36,999 (Valid for 30 days). 42GB for N66499 (Valid for 12 Months). 10GB for N6000 (Valid for 30 days). 15GB for N10,000 (Valid for 30 days). If you have started using the MTN 4G service, can you tell us your view about the speed of their 4G network? 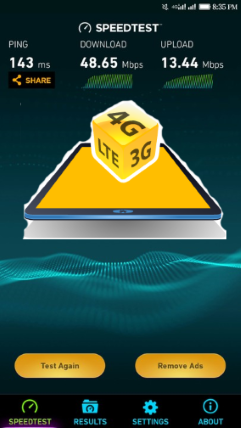 you just read the article about How to Activate Your MTN Sim Card For 4G LTE Services and can you bookmark or share with link https://ghchjgv.blogspot.com/2016/09/how-to-activate-your-mtn-sim-card-for.html so thank you.